Sort of my favorite outfit I have worn in a longggg time. Too bad I stepped out of my apartment into psychotically oppressive waves of soul-suffocating New York City heat. In case you were wondering, I wish desperately that I was escaping right now like I did last summer...I MISS YOU, PORTLAND! IF MY HEAD IS TILTED MAYBE YOU CAN'T TELL MY BANGS ARE CROOKED AS HELL? NICE SMIRK, NOT FOOLING ANYONE CROOKED FACE. Thrifted French Toast (!) 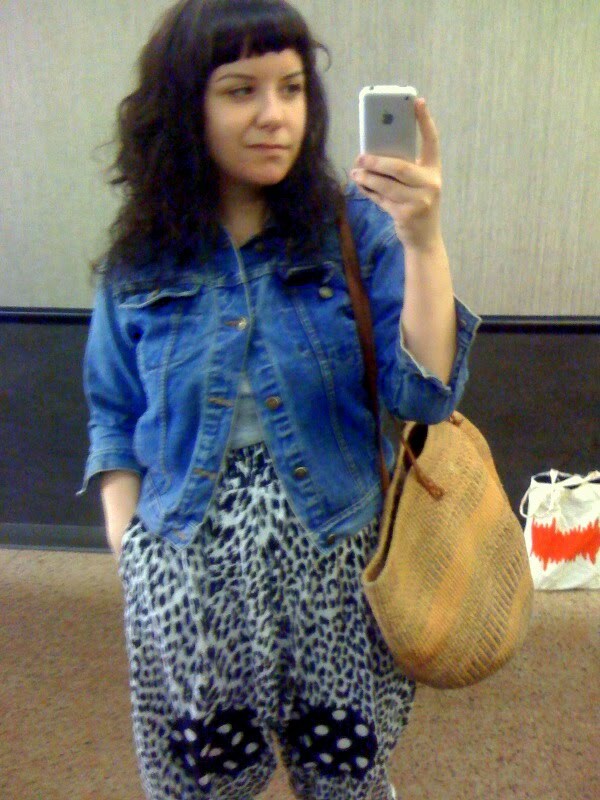 little boy's denim jacket (from the recent Connecticut superhaul), grey tee, Peggy Noland highwaisted-dropcrotched-kneepatched cheetah print pants (with a second set of pockets at the knee), thrifted hippie straw bag that I dig cause my grandmother had one. I had a lil meeting that day with my girl Kate Fleming..who was wearing her Céline wedges. I DIED. I was wearing Jeffrey Campbell Snicks, TWINS MUCH? The color discrepancy in our skintones is appalling. I am such an indoor kid. What's a "tan"? oh, i liiike your outfit, and i want your shoes. now! cute shoes! they look super comfortable. In all honesty, your bangs looks purposly cut like that and I'm loving them! They actually look cool crooked! Those pants are sick, and I'm loving all the denim you've been rocking lately.... that triple denim outfit a few posts back? Wow. ps- my legs are whiter I promise you. Check my blog if you don't beleive me, ha! i'm dying over the fb use of "JELLYBALLS". LMAO at "white girl problemz!" Don't worry... this pale black girl has the same problem! haha! knee patches that rock! love your bangs too. You crack me up. My friend says the same thing about me and being outdoors. She says the only time she's seen me outdoors voluntarily is at disney world. i love your shoes mucholots! Oooh, I've been looking for some shoes like that! Are they easy to wear? And agreed on the heat. I thought I would melt on Wednesday. Little boy's denim jackets are the future; mine's the best denim jacket i've ever known. I don't care if I can't fasten it. Tans are overrated anyway! One day, someone will be jealous of our milky white complexions...right? Love the shoes (your's AND kates). And knee pockets? Ha, I'm moving back to NYC and the heat is the only thing I'm dreading. Cute ensemble just the same! dude, seriously, knee-pockets? How could pants be any AWESOME-ER?!!? Those clogs are awesome!!! You have amazing bangs. I'm jealous. Check out my blog whenever you get a chance. Thanks! I really think the Celine wedges are great. Your drop crotch/harem pants are so B.A. it gives you like an African Tribal vibe. Love those shoes! I want! your grandmother had one? dude, I HAD ONE. What a wonderful post, thanks so much for sharing this with us, brilliant post. I love your shoes, they are so cool!